Pain plus damnation plus stickers equals fun! Painkiller: Hell and Damnation has been one of those games that gives its love to PC gamers first, console players later. The game hit Windows late last year and has already had a patch and two pieces of DLC to spruce up the experience. While the console versions won't hit until April, publisher Nordic Games plans on keeping the experience as parallel as possible. 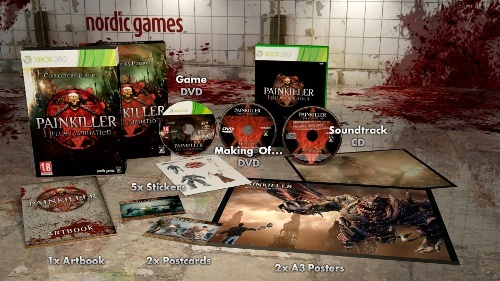 Case in point: Painkiller: Hell & Damnation Collector's Edition for Xbox 360 and PlayStation 3. Co-op play on all systems allows for two players either online or local. Painkiller: Hell and Damnation hits Xbox 360 and PS3 systems on April 5th.